Spain’s Fernando Alonso snapped a year-long win drought to take the Singapore Grand Prix Sunday, winning a drama-filled first ever night race as a comical error cost Felipe Massa dearly. It was the Renault driver’s first victory since the Italian Grand Prix last year and capped a remarkable weekend that saw him top two of the free practice sessions but start 15th on the grid after a mechanical problem in qualifying. He claimed his 20th career triumph by 2.95 seconds over Germany’s Nico Rosberg in a Williams and Britain’s world championship leader Lewis Hamilton in third. Toyota driver Timo Glock was fourth with Toro Rosso’s Sebastian Vettel following up his win in Italy this month with fifth. BMW Sauber‘s Nick Heidfeld took sixth. “It is fantastic, I am extremely happy. I can’t believe it right now and it will take a few days to realise what we have done,” said Alonso. The race was a new experience for every driver on a street circuit under powerful spotlights and it turned out to be one of the most exciting of the season. Despite dark clouds lurking, Singapore’s notorious tropical downpours stayed away and the whole race was run in dry, but hot and humid conditions. Rosberg scored his best ever finish and was over the moon. “The car felt pretty good and we knew we could be strong on this track and for once the luck went with us,” he said. Similarly, Hamilton was happy to get points while Massa didn’t. Ferrari’s Massa started from pole but a disastrous mistake cost him the race and valuable points in his push for the world title. His 13th place finish means he is now seven points behind Hamilton in the championship hunt with just three Grand Prix left at Japan, China and Brazil. The Brazilian was in the pits on lap 15 when he was given the green light and drove off with the fuel hose still attached to his car, leaving one of the pit crew floored and subsequently carted off in a neck brace. 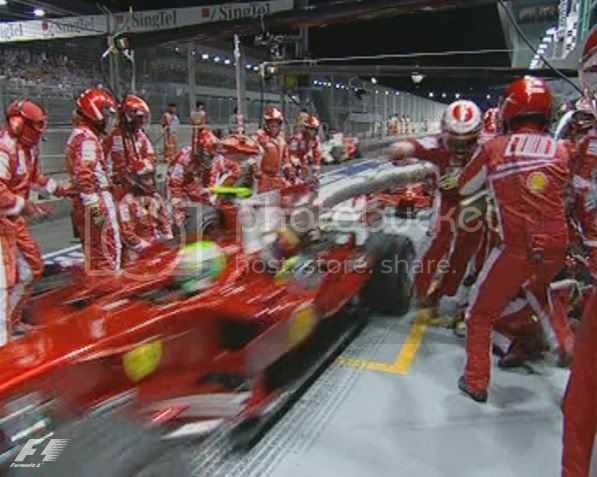 Massa ended up sitting in his Ferrari at the end of the pit lane as the crew ran after him and managed to pull the hose free, but it ruined his chances. He was given a drive through penalty and rejoined in 18th place. It was a miserable night for Ferrari with defending world champion Kimi Raikkonen ramming his car into the barriers with just four laps left. The Massa drama occurred after the cars came in when Nelson Piquet careered into the wall, causing massive damage to his Renault. He climbed out unscathed but the safety car was deployed. Massa was leading at the time with Hamilton second but at the restart, Rosberg was in front and Alonso fifth. But Rosberg was subsequently slapped with a 10-second stop penalty for coming into the pits before it had opened after the Piquet crash. The complicated scenario saw Toyota’s Jarno Trulli in the lead on lap 28 but without having pitted with Alonso second, Rosberg third and Hamilton charging in sixth. 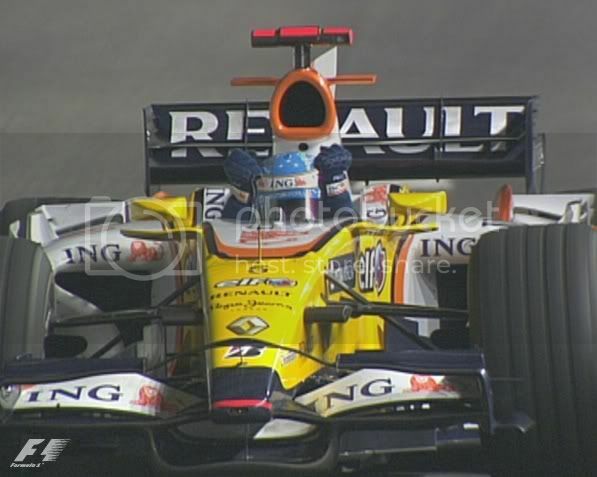 With Trulli taking his first pit stop soon after Alonso amazingly found himself in front just after the halfway mark with a 4.9 second lead over Rosberg. Alonso came in for his second pit stop on lap 41 and came out still ahead, marginally ahead of David Coulthard and Hamilton. Remarkably, when Coulthard pitted soon after, he too drove off with the fuel pipe attached, knocking over a mechanic who was stretchered off with an injured ankle. There was more action to come. Alonso was cruising with a 23 second lead when Adrian Sutil shunted his Force India into the wall, bringing the safety car out again and wiping out the Spaniard’s advantage. When they restarted with seven laps left it was a sprint to the finish and two-time world champion Alonso made no mistake, writing his name in the record books as the first winner of a Formula One night race. I great race to watch! What is it with these pit stops, they have been bad several times this season. I think Hamilton will do it this year, in only his second F1 season. Quite an achievement. But he is our home town boy, so I am biased.